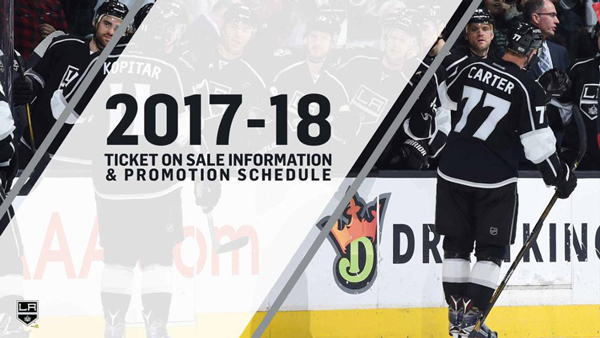 The LA Kings have announced individual ticket on sale information and their promotional giveaway schedule for the upcoming 2017-18 season. Single game tickets for all Kings home games at STAPLES Center for the 2017-18 regular season go on sale to the general public on August 7. American Express® Card Members will receive pre-sale access to purchase with their American Express card beginning July 31. Kings Season Ticket Members, Partial Season Members and eNews subscribers will receive access to pre-sales before the general public regular season on sale. Individual tickets can be purchased online on LAKings.com, AXS.com and by visiting the STAPLES Center box office. Full Season, Half Season, and Quarter Season Memberships are now on sale with limited availability, and these Memberships offer the most benefits, event access, and perks. Mini Plans and Flex Plans offering fans an introductory option to three or more games at a discounted rate and additional benefits will be available on August 7 as well. Group Tickets and Event Suites for the regular season will go on sale to the general public on July 31 with group deposit holders receiving priority access. The 2017-18 promotional game and giveaway schedule is highlighted by four unique bobblehead giveaways, a series of six limited edition collectible art prints, co-branded giveaways with the LA Galaxy and the Ontario Reign, and more. The team's flagship promotion will be the Mercury Insurance Bobblehead Series which will feature three players - each themed to one of our fans' favorite holidays. Kyle Clifford will be transformed into a zombie for Halloween (October 14), Tyler Toffoli will become a holiday elf (December 5) and Tanner Pearson will don a green uniform in celebration of St. Patrick's Day (March 17). Additional promotional games and giveaways will be announced at a later date, including LA Kings Legends Nights presented by McDonald's. In addition, single game tickets for all three LA Kings home preseason games at STAPLES Center will go on sale to the general public on July 31. The Kings will host three home preseason games at STAPLES Center for first time since 2005. Every home game is expected to sell out once again this season. The Kings enter the 2017-18 season having sold out a club-record 246 straight games (includes 33 playoff games). It is the 10th longest active current streak in the NHL. Sign up now or call 1-888-KINGS-LA for more ticket information about the 2017-18 season.